How Does Knowledge of a Looming Disaster Help to Save Lives? Thomas Andrews—who designed Titanic—knew that the huge ship could remain afloat with four flooded forward compartments. She would surely sink, however, if five forward compartments were flooded. Explain how the Captain and the ship's designer, Thomas Andrews, knew that Titanic was going to sink. How did that knowledge, of an impending disaster, impact the unfolding situation aboard the ship? 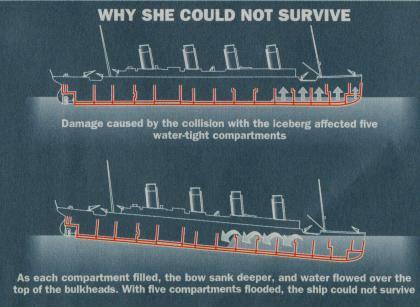 If you were the Captain, and you knew that five forward compartments were flooded—meaning that Titanic would sink—how would you handle the situation? Would your answer change if you also knew that the ship did not have enough lifeboats to accommodate all the passengers and all the crew members? If so, what would you do differently?